Your sojourn with the mountains and dales of Leh begins with your arrival at Leh Airport from where you will be heading to the hotel. Acclimatize yourself to the high altitude climate during the rest of the day. Take a local sightseeing tour and visit the city's landmarks that include Shanti Stupa, the Leh Market and Leh Palace which gives a view of the whole town. Overnight stay is at the Leh hotel. After a filling breakfast at the hotel you will be heading to Lamayuru. En route visit Liker Monastery, Magnetic hill and Gurudwara Pathar Sahib. Have lunch and gather your energies to experience the thrill of defying gravity at Magnetic Hill. Get enthralled by the Moon landscapes and the divinity of the Lamayuru Monastery and embark on a night drive to Sham; overnight at the hotel. Scenic Drives, Alchi Monastery, Hall of Fame, Evening at Leisure. This morning you will be meeting the route to Leh once again. On the way pay a visit Alchi monastery and bow your head in humility at the Hall of Fame Museum which exhibits Kargil War memorabilia. Reach Leh by afternoon and you have the evening to yourself at leisure. After breakfast start on an exhilarating drive to Nubra Valley via Khardungla Pass standing at a proud height of 18,380ft altitude, the highest motorable pass in the world! The elevation of the pass offers splendid view of the Zanskar Range that stands in stark contrast to the desert at Nubra Valley, a diversified view possible only in Leh. Enjoy a ride on two-humped camels in a safari arranged between Deskit and Hunder Village and head back to Nubra Valley for a night in a local hotel. Say hello to a divine morning in Nubra Valley and head to Deskit Monastery. Witness the magnanimous Big Buddha and be in the company of solitude. Enjoy the breath-taking view of Nubra Valley once more and retrace your steps to Leh for an overnight stay. Pangong Lake, Changala Pass, Lakeside Camping. The morning brings with it an exciting sense of anticipation as you head to Pangong Lake. On the way cross the splendour of Changla Pass at 17,350ft, the third highest motorable road in the world to finally fill your gaze with the enchanting view of the Lake. Your stay for the night is in camps on the shores of the lake! Enjoy the magical views around and the mesmerising colour changing phenomena on the water during sunset. Thiksey Monastery, Shey Palace, Sunrise Vistas. Watch the play of colors as the early morning sun peeps over the Pangong Lake � a sight that you're unlikely to ever forget! As you depart for Leh for an overnight stay, watch the magnificent architectures of Thiksey Monastery and Shey Palace as they beckon you to stop in your tracks. Transfer to the Airport, Tour Ends Here. 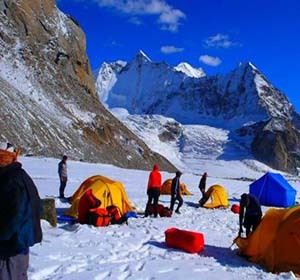 Say Goodbye to this tryst with the natural wonder that Leh is and depart for the airport towards your homeward journey.